Earlier this year I published A Humble Story Lives On, a post based on the work of Amy Cohen, a distant cousin of my husband’s. Amy has been busy over the last several months lovingly publishing a posthumous memoir written by Ernest Lion, another shirt-tail relative who survived the Holocaust at Auschwitz. Amy asked for my guidance in preparing the manuscript for publication, and I became intrigued with her project as well as the story. In this post Amy explains how she came across the story and why she decided to publish it. I find it especially intriguing that a story written late in life with no known plans for publication could be found and brought to the world by a stranger. It just goes to show that you never know where your words may end up. SL: Amy, how did you discover The Fountain at the Crossroads? AC: I was researching the family of one of my Schoenthal cousins—Rosalie Schoenthal. She was one of only two siblings of my great-grandfather who did not immigrate to the US from Germany in the late 19th century. She married Willie Heymann. All but two of their many children left Germany and escaped the Holocaust. The two daughters who stayed in Germany were killed by the Nazis. In trying to learn more about the lives and deaths of these cousins, I found out that one of Rosalie’s granddaughters, Liesel Mosbach, had married Ernst (later Ernest) Lion. Although Liesel was killed at Auschwitz, her husband Ernest survived. One online source included a link to a memoir written by Ernest Lion. I clicked on the link and printed out the 200+ page manuscript. I read it in one sitting over the course of a day, tears streaming down my face, unable to put it down until I reached the last page. SL: What did finding the story mean to you? AC: Although the fact that Ernest was a relative initially drew me to his book, I quickly realized that his story is the story of more than six million people. It’s the story of how the Germans tried to strip them of their humanity and lives. But Ernest, like countless survivors, refused to surrender his humanity or dignity. The narrative brings you into his experiences and also his mind, allowing the reader to understand the reality of life at Auschwitz and perhaps even more importantly what it was like to survive during and after that experience. This book reveals both the darkest and best of human nature. Ernest’s ability to persist, to escape, to build a new life in a new country, to find love and purpose is inspiring and deeply moving. SL: How did you decide to publish it? AC: After reading the book, I felt strongly that it needed to be read by others. But aside from a few links to the rough manuscript, there was no way for people to find this 200 page manuscript. And with no chapters and crude formatting, it was difficult to read. So I decided to see if I could get permission to edit and publish the manuscript to make it more readable and publicly accessible. SL: What challenges did you face? First, I had to find out who had the rights to the book. I knew Ernest was deceased and that he had a son, but I had no way to contact him. Ernest had acknowledged a number of people in the book, including Randall Wells and Suzanne Thompson, his writing instructors at Coastal Carolina University. Through the university, I got in touch with them and got contact information for Ernest’s son Tom. I soon learned that Tom was the sole heir to Ernest’s estate and thus owned the book’s copyright. Tom liked the idea of making his father’s book more accessible, so I began editing the manuscript. Wanting to preserve Ernest’s voice and leave content intact, I did nothing but add chapter headings, fix typos here and there, and reorganize one section so the chronology flowed more smoothly. The second greatest challenge was figuring out how to publish it. That’s where you came in, Sharon, with advice on how to create a professional looking format. Your important suggestion that I use CreateSpace made the process of getting the book on Amazon in both print and Kindle format relatively easy. SL: What are your hopes for this volume? AC: I hope that a multitude will read the book. We set the price low to keep it affordable. Our hope is that readers will gain a deeper understanding of the Holocaust and human nature. I am hoping that schools and libraries will put the books on their shelves. I am hoping that the book will be reviewed in places where it will draw the attention of history buffs. We need help spreading the word. 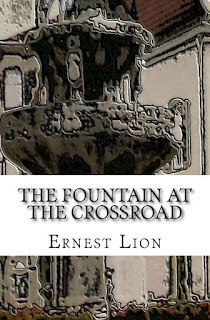 Fountain at the Crossroad is available on Amazon in both print and Kindle versions. You can find them here. Whatever small profits may accrue will be donated to the United States Holocaust Memorial and Museum in memory of Ernest Lion. For an extensive array of family history stories collected and written by Amy Cohen, visit her Brotmanblog: A Family Journey. I'm so glad you are still slaving away at the blissful work of memoir reading and writng. I just was reading an article about Joseph Campbell. He famously said "follow your bliss" - meaning follow the passion of your heart. Later he was criticized for promoting self-indulgence. "He grumbled, "I should have said follow your blisters."" 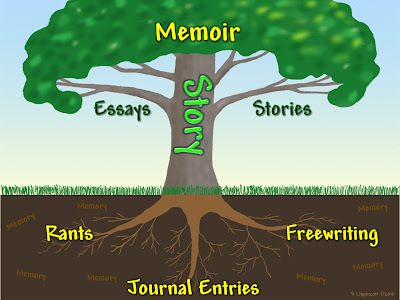 That sounds about right for what "memoir warriors' do to bring life stories to life. Hi Jerry, Thanks so much for your interest. Ernest registered the book for copyright registration in 2000. Thanks for the clarification Amy. Jerry, I know you'll treasure this read and may want to explore it further when you have a break from your other pursuits. I am Tom Lion, Ernest Lion's son. I'm not sure, but my dad started to write his memoir in the latter part of the 1990's. He worked on it sporadically whenever he found the mental strength to continue. With the help of the staff at Coastal Carolina University, he was able to achieve his goal. He struggled mightily as this project caused him to relive his torment in the most minute detail. Thanks for the input Tom. Your father made a noble effort to transcend that pain a second time so we can have this valuable record. If I could give him a Medal of Honor, I'd do it in a heartbeat. Such generosity of spirit is the sign of a true hero. Thanks for the input Amy and Tom. The story about a search for ancestors, contained in the interview make a fascinating story before even reading the book. Tom, have you written anywhere about the impact this book has had on you? Would you care to comment on it here? What a great story, Sharon! Wonderful of Amy to care enough to take on this project of saving history and making it accessible to others. I'm glad it is so easy and affordable these days to publish--but the rest is still a lot of work! Ernest had to have fortitude to write about this pain, but stories like this need to be told. Thanks Linda. Amy did have a learning curve with Word since in her previous life as an attorney, writing involved little more than straight typing. Books require thought about font, page layout and other aspects that make them easily readable. That's where I came in as a coach. Tom took care of the cover. I know you can relate to all of this, having saved your mother's story for history as well as a few others. And Sharon was an amazing coach! I just hope I can remember 10% of what she taught me so that I can use it on my next project. And I never could have done this without the support of Ernest Lion's son Tom. He supplied the manuscript, the photographs, and the beautiful photograph of a fountain for the cover. But, of course, the ultimate thanks goes to Ernest Lion himself, who had the courage and the moral fortitude to write this book so that future generations would understand the Holocaust and prevent it from ever happening again, something that we somehow still need to worry about.